Packages | Are you a renewing subscriber? Click Here to renew your subscription online. Four unique concerts featuring the core orchestra of the Philharmonic, an up to 40-piece ensemble of full-time Philharmonic musicians. Features 3 performances at the First Wayne Street United Methodist Church and 1 performance at the Arts United Center in collaboration with Fort Wayne Ballet. Choose an available section for each group of performances to see ticket options. William Shakespeare’s ode to the summer solstice relishes in joyful abandon and dreamlike fantasy, a world of non-stop adventure. Duruflé’s masterpiece is softly luminous, sumptuous, and suffused with a tender radiance. An unlikely Requiem, it is a work of noble and restrained eloquence. 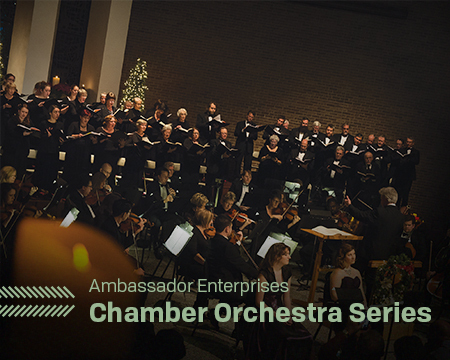 Handel’s most recognizable and revered masterpiece is performed to the warm glow of candlelight. Experience the “Hallelujah” Chorus and other unforgettable Christmas favorites. Conducted by the winner of the 2019 Fort Wayne Philharmonic International Conductors Workshop, this program represents the pinnacle that beauty has attained in the sphere of music.